Henrikh Mkhitaryan has so far struggled to make an impact at Old Trafford. Henrikh Mkhitaryan has struggled to make an impact at Man United. 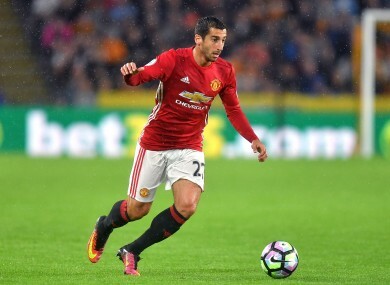 WHEN MANCHESTER UNITED bought Henrikh Mkhitaryan for a fee of around £30 million in the summer, it was assumed the Armenian would go straight into the first team. After all, at 27 years of age, Mkhitaryan is not exactly a player for the future. Yet so far, he has made just five appearances for Man United and one start — the 2-1 defeat by Man City on 10 September when he was hauled off at half-time. After the City defeat, Mourinho was heavily critical of the Red Devils’ first-half display. We need to be sharp the way we think, the way we play. The decision to take off Mkhitaryan at half-time and his scathing post-march criticism confirmed that Mourinho was far from pleased with the former Dortmund player, who scored 18 goals for the German side last season. Since then, Mkhitaryan has not played a minute of action for United’s first team. The player was injured for a period, after hurting his thigh on international duty, but he is now understood to be fit again, amid some journalists’ claims that the coach was not happy with the effort (or lack thereof) that the player put into his recovery. Mourinho recently confirmed that Mkhitaryan is fit, but added that he lacks the intensity and match sharpness to play top-level football currently. When asked if he would play in last week’s clash with Fenerbahce, Mourinho’s response even seemingly contained a subtle warning to the player that he had not been playing at the level expected of him. I cannot confirm that he will play, but now he is fit and it is now time for him to go back to the levels that we know he can achieve,” the manager said. After the Europa League clash, Mourinho explained the Armenia international’s absence, telling BT Sport: “I play with Lingard and Martial, I have on the bench Rashford and Memphis Depay, I cannot play with everyone at the same time. Yet the fact that he did not make the matchday squad for either United’s Europa League or League Cup clashes — games where second-string players are invariably afforded a chance — has sent the rumour mill into overdrive. For yesterday’s Man City clash, Mkhitaryan actually did make the initial 20-man travelling party but was cut from the final 18 ultimately. One suggestion put forward is that Mourinho never wanted last year’s Bundesliga player of the season in the first place, and that the transfer was set in motion before the Portuguese boss took charge. A less sensational possible explanation is that Mourinho is genuinely keen to ease the player back and was unwilling to risk him in the succession of big games that United played recently. There has also been speculation that the player — who speaks six languages — is an introvert whose personality clashes with the more brash Mourinho. “Mkhitaryan is regarded as a sensitive character, something that can, at times, hold him back, and it certainly took him a long time to settle in Dortmund so the same may now be applying for the 27-year-old,” writes The Telegraph’s Jason Burt. Yet despite all these issues and the inevitable rumours that the star will be sold in January, the latest reports indicate Mkhitaryan remains determined to stay and fight for his place at Old Trafford. Speaking in pre-season, the midfielder even acknowledged that a spot in the first XI was far from assured. It doesn’t matter if they buy me for, I don’t know, £38m or £40m, I am not guaranteed to play the games,” he said. And while Man United coped reasonably well without Mkhitaryan last night, it has been a difficult start to the season overall, with the club currently sitting six points behind leaders City in seventh. At times this season, most notably against Chelsea last weekend, the Red Devils have looked short of creativity. Mkhitaryan produced 20 assists for Dortmund last season, and so is seemingly the ideal solution to the problem. Yet despite all the recent turmoil, Mourinho continues to keep him out in the cold as winter approaches. If the United boss hasn’t definitively made his mind up already, then the next few weeks could decide whether he is frozen out for good. Mkhitaryan has put in one sub-par performance already — now, it seems, he can scarcely afford another as he seeks to regain his manager’s trust. Email “The curious case of Man United's missing £30 million man”. Feedback on “The curious case of Man United's missing £30 million man”.